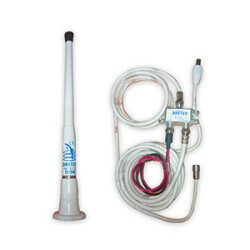 The Banten DVB-T Digital Whip Antenna is suitable for Boats, Caravans or RV's. It comes complete with a solid mounting base and equipment, a length of coaxial cable with fittings as well as a power amplifier. This unit has the option of being fitted using alternative mounting equipment - rail mounts, folding mounts, etc. Image quality is very important when referring to the Terrestrial Digital Marine TV, in particular, a clean picture with great signal strength. Banten has used an upstream filter at the amplifier to help amplify the useful part of a signal for better picture quality. 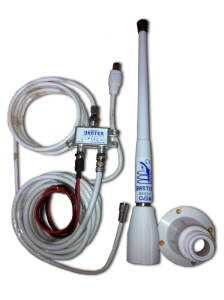 Banten has also designed the amplifier within the same body of the antenna to further reduce possible interference. The product has a stylish design with a wide range of accessories for easy installation. 24dB of REAL gain (with gauge HP). Protection against noise interference from mobile phones and WIFI, resulting in a clearer signal. Filter rejects frequencies with substandard signal quality. Amplifier works to heighten clear signals. Quick installation through easy access to the F connector. accessories allow the antenna to be mounted on any surface. SNAP-ON base allows quick release in the event of impact. MIRROR base enables installation on roof racks, ladders, bike racks, etc. Shape Matching with VHF antenna or AM/FM in the same factory, to maintain a lean design on boats, motor homes and camper vans. Fewer pieces to assemble, resulting in a faster installation. Only one 12mm hole required.